The trailer you see above is for, if the headline wasn't enough, the Xbox LIVE Arcade exclusive Happy Wars. It was originally shown off to convention goers that visited Microsoft's booth during the Tokyo Game Show a few months ago. Now the clip has been given a place on YouTube and a chance to shine for the world at large. The campaign mentioned above is set to have several missions for solo gamers to play through; however, according to the Toylogic's (the studio behind the product) news release for the trailer, that's not where the "real fun" is to be had. 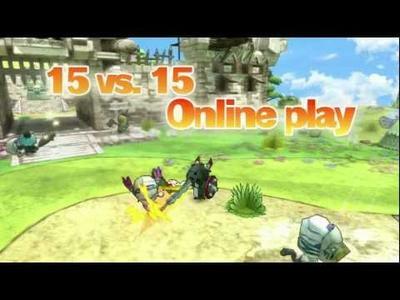 "The debut trailer shows the real fun experience of 'Happy Wars', including 15 vs. 15 online play and the spectacular actions of the 3 classes – the warrior, the mage and the cleric, all in HD quality." The look of the style within the trailer is actually rather striking. PlayStation 3 and PSP owners may actually find some shared visual qualities with one of their best gaming options, Fat Princess. As it's being published by Microsoft Studios, Happy Wars will likely only see life on the Xbox 360's LIVE Arcade platform. According to Toylogic, the game will release sometime in 2012.